Sumi Abedin, a survivor of the factory fire in Bangladesh that killed 112 workers on November 24, 2012 is touring the U.S. to shed light on unsafe working conditions, and to demand that workers be compensated for the loss of lives and work in the amount of $5 million. Abedin worked as a seamstress at Tazreen Fashions. 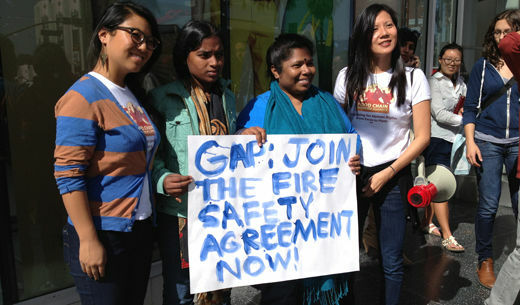 The Bengali garment workers are also demanding that GAP sign the Bangladesh Fire and Building Safety Agreement to ensure worker safety. In the video below, she is marching in front of a GAP store in Hollywood California. She reports that when fire broke out the supervisors told the female employees to return to work but smoke soon filled the factory. Recounting her experience Abedin said when the fire broke out the workers began to run but the stairs were locked. With the smoke and flames too fierce to escape, she jumped from a third story window. Abedin stated that she did not jump to save her life but to insure her burned remains would not be recognized by her parents. After landing she lost consciousness breaking her leg and arm plus the ankle she used to operate the sewing machine. Abedin reports many others have broken backs, spinal cords and other severe lifetime injuries. Abedin also suffers from nightmares. During her 10-day tour, Sumi Abedin, will join labor activists on the steps of executives’ homes and in front of the corporate headquarters of companies like Walmart. The effort is part of a growing campaign by labor rights activists and union groups to publicize poor working conditions at overseas factories producing clothing for U.S. consumers. Abedin says death traps are common in factories such as hers.